While walking through the Research Vineyard today with Nick Martin (Vineyard/Winery Mgr and Vit/Eno Faculty), we made some decisions on which varietals to replace with a new varietal next year. Some of these failed miserably in the vineyard this year for various reasons, most notably the brutal winter last year. Then we added insult to injury with the May 15 freeze. The varietals that we are going to replace are: Neptune, Cabernet Franc, Chardonnay, Gruner Veltliner and Riesling. 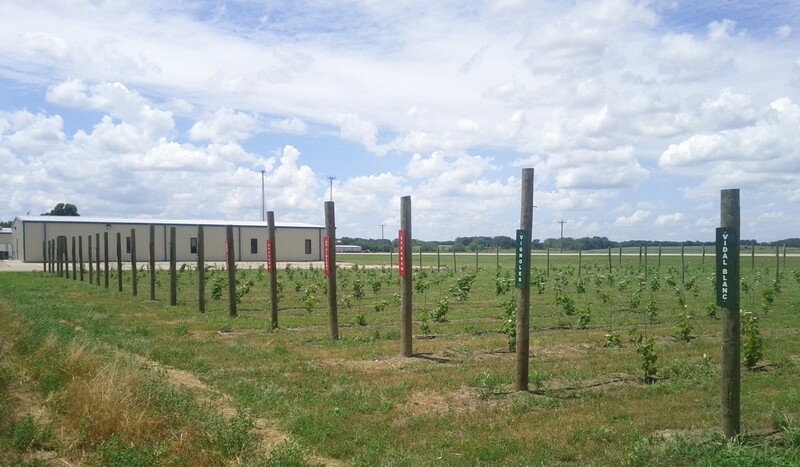 We also decided that since we just planted an acre each of Chambourcin and Traminette across the highway less than 1 mile away that we would also remove those two varietals from this vineyard to make space to try other hybrid varietals to compare with everything else. 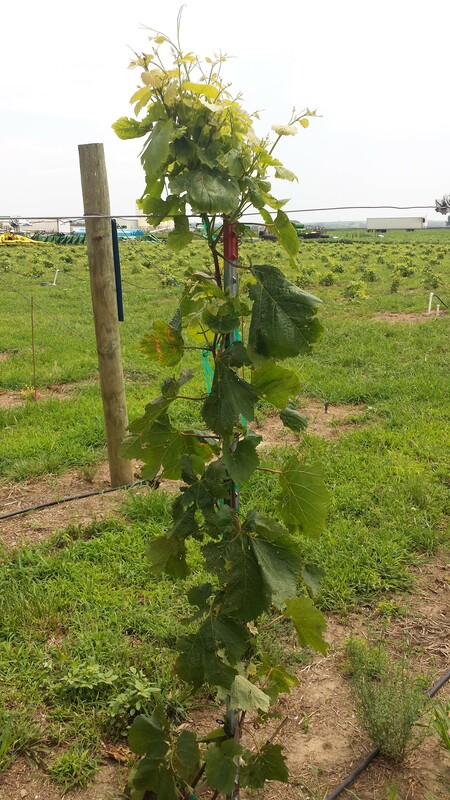 There were a few varietals that did not do particularly well in the Research Vineyard after one year, but we want to give them a second chance to see if it was just a fluke winter or if they really should not be planted in this particular location. These are Lemberger, Zweigelt, Chardonel, Vidal Blanc and Valvin Muscat. 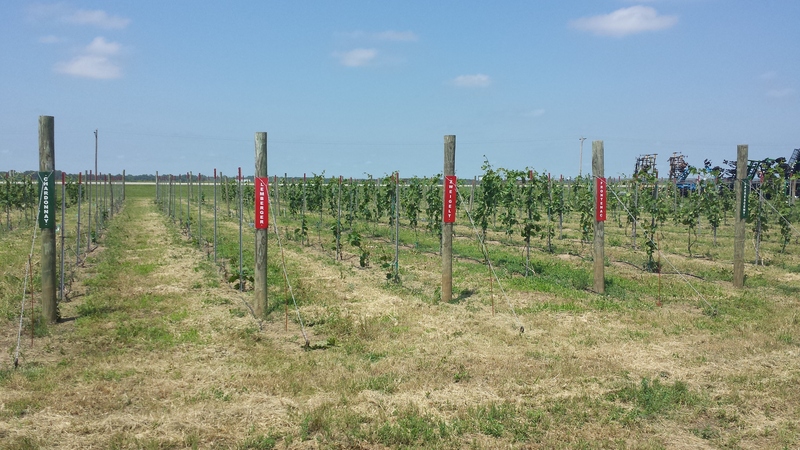 We will replant the dead vines in these rows and hope next year will yield better results. It is worth noting here that we are also pulling our Cabernet Franc in the Oregon Trail Vineyard as only 4 of the 25 two-year-old vines survived last winter. Two weeks ago we mentioned that the vineyard suffered a hit from chemical drift. The signs of that event are still quite evident throughout the vineyard. 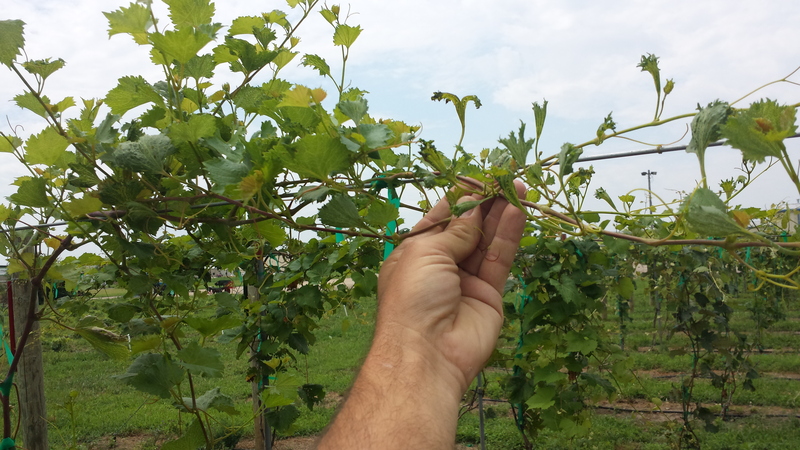 Nearly every vine shows at least a few leaves with chemical damage. Photos from the vineyard will be posted below. The varietal with the most notable damage is Rougeon. All 12 vines survived the winter and late freeze; however, these vines have nearly stopped all growth since the drift event. You can see from the photo below that the internode lengths have gone from roughly 4 inches down to just 1 inch, and every leaf grown in the past few weeks shows severe damage. Most of the table grape varietals also show dramatic damage since the drift event. These varietals have leaves nearly the size of a soccer ball (or futbol as it is called in World Cup competition). However, most of the growth since the drift event is producing leaves the size of a golf ball or smaller. 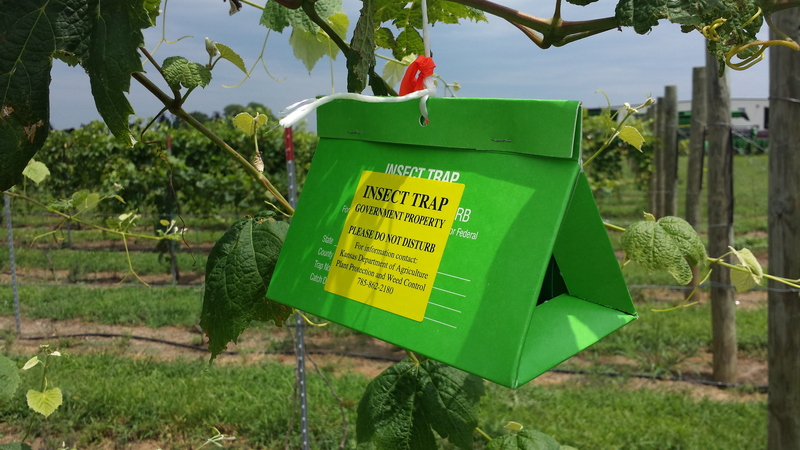 The photos below will show that stunted growth in both Jupiter and Concord vines. 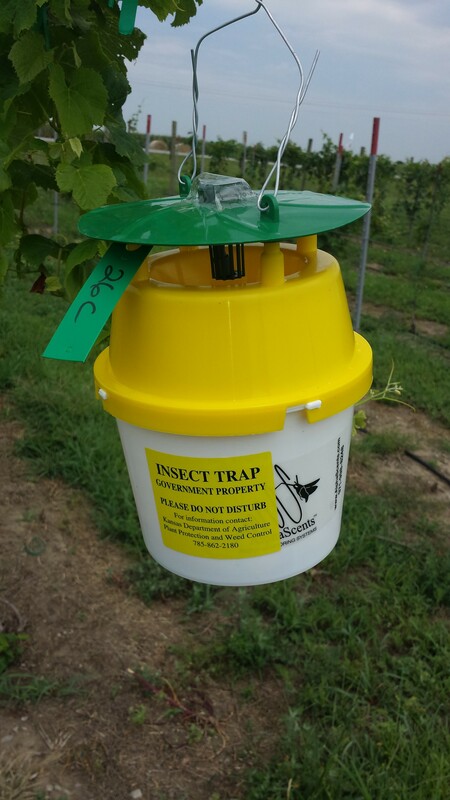 Finally, the KS Department of Agriculture has set some insect traps in the vineyard. There are photos of the two types of traps below as well. Jupiter vine approximately one month after drift event. 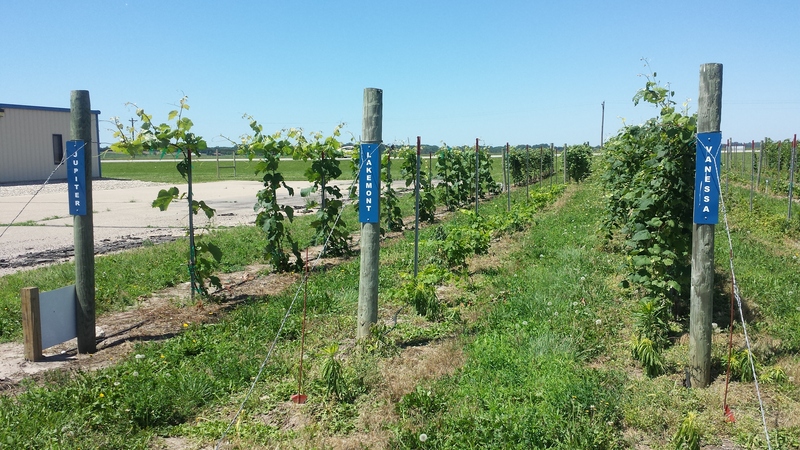 Note the large, healthy vines below and then the scrubby growth since the drift event atop the vine. My how time flies. I thought I’d skipped two weeks, but it’s been almost a month! Sorry about the delay. As with the last post, the numbers of surviving vines has essentially remained the same. Today while walking through the vineyard I took note of any leaf damage. Here is a document showing photos of leaves damaged due to chemical drift and one photo of the disease leaf phylloxera: Leaf damage – drift and disease. 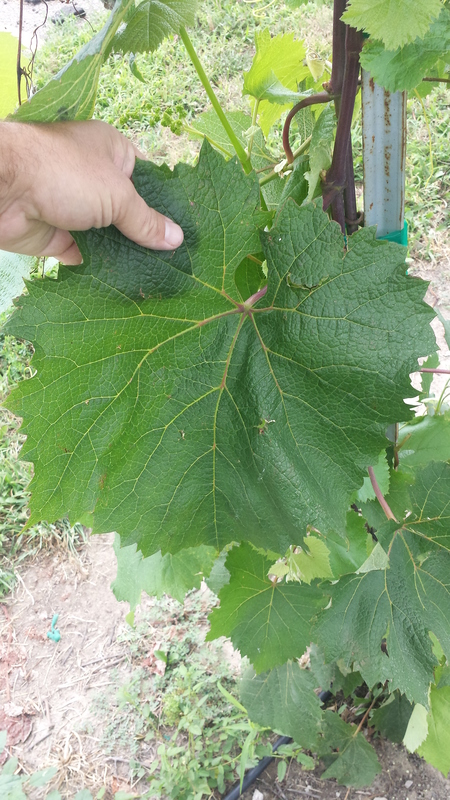 While walking through the vineyard a couple of weeks ago, I thought I noticed some interesting, strange, irregular growth in some of the new leaves. I wasn’t sure if it was drift damage or just new leaves on adolescent vines growing funny, so I decided not to write a post that week. Wait and report what happens was the approach I took. Here we are three weeks later, and I was correct. It was drift damage that I noticed, in nearly every variety of vines. 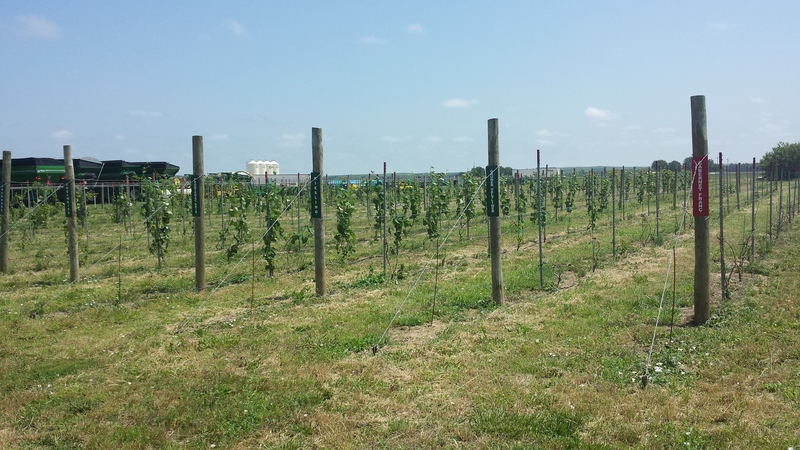 The varietals that appear to be hit hardest are the table grapes (Concord, Jupiter, Mars, Neptune, Suffolk Red, and Vanessa) as well as Lacrosse, Fredonia, Marquis, Norton, Rougeon, Regent, and St. Croix. Hardest hit of all is the Rougeon. It seems those vines stopped in their tracks since the event and have either had no or very little growth since. The table grapes all show the classic symptoms. They not only have the wicked looking leaves (see photos in document above), but the internodes; that is, distance between nodes are much shorter than earlier in the season. The chemical drift hit is bitter-sweet. It’s unfortunate to see the vines damaged after the long hours and financing needed to plant them, but it is also a good test to see which vines were hit hardest and which weren’t. Of course, wind conditions and the direction of the sprayed field, among other things also have an effect on which vines are hit hardest. To see the locations of the rows in the vineyard which were hit hardest, refer to the vineyard map on the opening page of the blog. Other observations in the vineyard include the Frontenac has made a new set of flowers trying to make fruit, even though we already pinched off the beginnings of berries a month ago. Same thing with the Seyval Blanc, just like last year. I suspect the Seyval will probably go again once more before the summer ends.